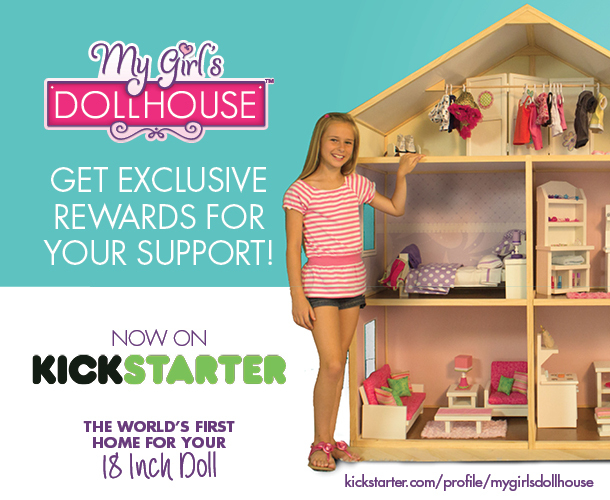 Imagine a world where little girls have a place to house their favorite large dolls and doll clothing and accessories… GoodToy imagined that world and they are excited to introduce My Girl's Dollhouse - the world's first ever home custom made for your 18-inch dolls! GoodToy has created My Girl’s Dollhouse, the world's first high-quality, pine wood frame, customizable huge dollhouse where 18" dolls can reside along with their prized furniture, clothing and accessory items. No big surprise but Roo LOVES this idea. Her American Girl and Karito Kids dolls live on a bookshelf and the super cool accessories are scattered all over her room. It would be awesome to have them all in one place, where they are always set up and ready to play with.